Start your journey to excellent oral health and a beautiful smile with Sugar Creek Family Dental discounts and new patient specials. Everyone enjoys a special price for services they need. 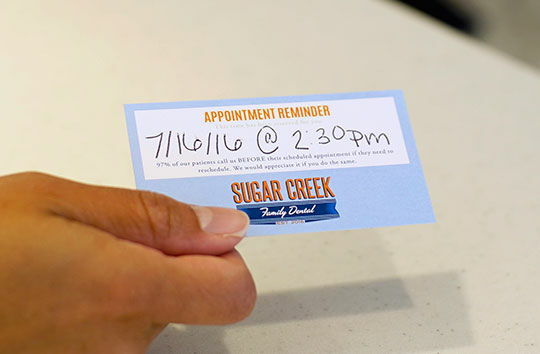 At Sugar Creek Family Dental, we offer our new patients some valuable coupons for their first visit. Just let our friendly team know which coupon or offer you would like to use and we will apply it to your service. At Sugar Creek Family Dental, we want to help you afford the dental care you need or cosmetic services you desire. Our patient specials are our way of giving back to our patients with fantastic offers for popular services. Whether you are lacking insurance for your routine checkup or would like to try an elective cosmetic procedure such as teeth whitening, we have dental specials designed to save you money. Our goal at Sugar Creek Family Dental is to give our patients the best care for their health and their smile. Our patient specials are one way that we can make our services affordable for everyone, giving all our patients an option to improve their smile and dental health.